Both Lodge Yard and the King’s Arms were created by local man John Pratt in the 18th century. Pratt developed a love of horseracing while studying at Cambridge, having himself ridden at Newmarket. Returning to his home of Askrigg in the Yorkshire Dales, Pratt became a racehorse breeder as well as master of the Askrigg Harriers. In 1752 he built Lodge Yard as racehorse stables. You’ll notice how the properties are arranged around a central courtyard area, and will still be able to see the large archways that would have been used. The semi-circular central section, which was backed by the stable buildings, was where the pack of hounds lived. Their enclosure or hound pit on the lower level was surrounded by kennels, whose interesting little doors you can still see today. They have now all been restored and the courtyard makes a really nice place to sit. The nearby King’s Arms Hotel dates from the late 18th century and was also built by Pratt as a coaching inn. Though it has undergone a number of changes in its time, the really notable one took place in the 1970s when Askrigg was chosen to represent the fictional town Darrowby in the BBC series All Creatures Great and Small. It was the home of fictional vet James Herriot, and The King’s Arms played the role of the Drover’s Arms, where many scenes were set. 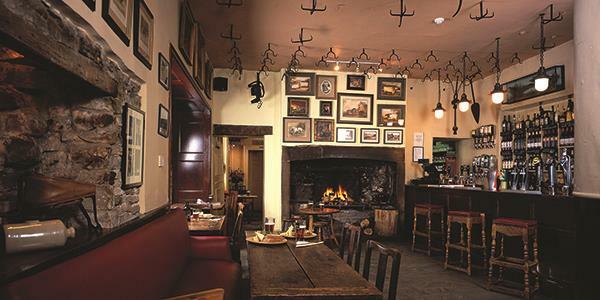 It’s a great place to visit for a pint or a bite to eat, and makes for exclusive, quirky accommodation too if you want a getaway in the Yorkshire dales. Find out how you can stay at Lodge Yard o the King’s Arms hotel by entering your details below for a free brochure!